You can be inflamed / have pain from being overweight, having cardiovascular disease, and eating a diet full processed foods, be stuck on Rx opioids, neuroleptic drugs, have fibromyalgia or Ehler Danlos Syndrome, and you can still get better. Life does not need to be this way. At my sickest, I couldn't walk to the corner without needing to lie down, getting diaphoretic, nauseated and lightheaded. Now I'm pretty sure most people wouldn't suspect there was anything ever wrong with me. One of the things that worked so well for me to extinguish the flames of inflammation (besides a low inflammatory diet) was taking anti-inflammatory supplements that don’t compromise the gastrointestinal tract like NSAIDS or steroids. Almost all of my patients struggling with pain and inflammation use at least a few of the below supplements to kick inflammation in the booty! The next question is where in the world do you start? If testing is not an option, a great place to start to get a little extra vitamin A, C, D, E and some B’s and make up for past dietary indiscretions through a quality multivitamin (all vitamins in their active forms). Generally speaking 80+% of my patients have low vitamin D when first tested, so taking a little extra for a month or so can be helpful to put-cha in an optimal level since systemic chronic inflammatory processes use up vitamin D quickly. If your diet is low in omega 3 fatty acids (avocados, olive oil, fish, nuts and seeds) then I’d consider adding a clean sustainably sourced fish oil, high in EPA/DHA. If pain is ruling your days and nights, consider adding in curcumin. It is very well studied and has been found to be helpful in dampening inflammation (by reducing NFkB pathway signaling) associated with everything from osteo and rheumatoid arthritis, to cancer, heart and liver disease as well as Inflammatory bowel disease. The master antioxidant in the body is called glutathione. If oxidative stress is the primary driver in your body’s inflammation, or if you have a known methylation or detoxification defect like the MTHFR or CYP mutations, then taking oral s-acetyl glutathione or using it topically can mount your body’s defenses to do its job of free radical scavenging and thereby decrease the inflammatory response of the body. Alpha Lipoic Acid, ALA is a fatty acid produced by our body. It plays a key role in metabolism and energy production. It also functions as an antioxidant, protecting your cells from damage and helping restore levels of other antioxidants, like vitamins C and E. ALA acts via inhibition of the NFkB signaling pathway to resolve inflammation. SPMs are a large class of cell signaling molecules that are created by the metabolism of polyunsaturated fatty acids. Meaning those healthy EPAs and DHAs in your fish oil supplement have this even better substance within them that has been isolated and concentrated into a supplement that acts directly on the inflammatory cascade gone haywire in such disease as cardiovascular disease, Alzheimer's, diabetes, MS, lupus, Hashimoto’s and so on. 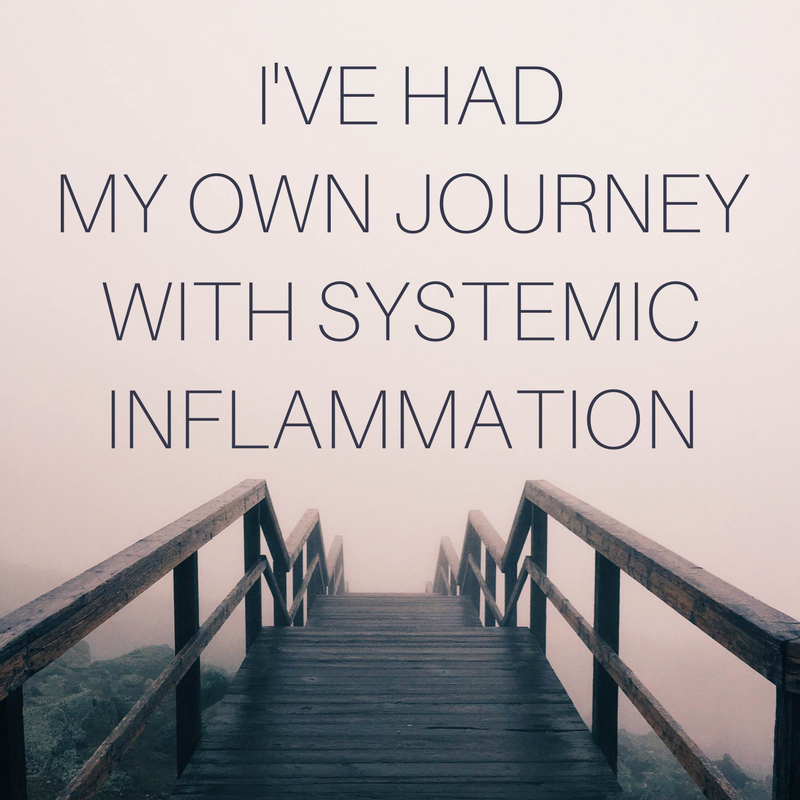 And now, I take a functional medicine approach to treating systemic chronic inflammation. I listen to your story, find out what particular themes, patterns, predispositions, and any prior diagnoses you have, and make suggestions specific to your body’s needs. I do this to get to the root cause of your condition and resolve your symptoms for good. If you are interested in a free, no obligation 15 minute transformational health consultation to address the drivers in your body’s inflammatory condition please reach HERE.